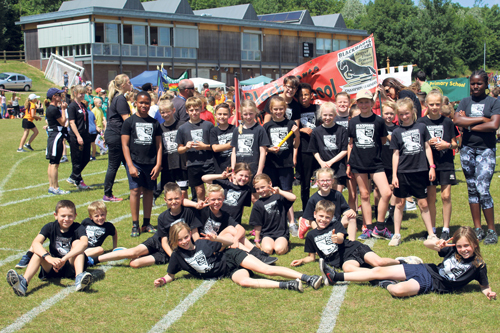 BLACKHORSE Primary School in Emersons Green has been making a name for itself in the world of cross-country running over the last few years. Now it wants to go further – by installing its own running track around the school field. Nine former Blackhorse pupils run at a national level and Ethan Gill is the best long jumper in the South West. Blackhorse’s 60-strong Track Team has won the CSET cross-country league for seven years in a row and the school boasts five out of the top 10 ranked girls in South Gloucestershire and one of the top ten boys. More than 30 children run the daily mile every lunchtime, led by headetacher Simon Botten, who is a keen runner and is due to take on the Green Man 45-mile Ultramarathon around Bristol this month. The school hopes an all weather track will inspire more current and future pupils to lead an active and healthy lifestyle and possibly become future champions. A flat even surface will also mean that children who are visually impaired or need a little more guidance can gain the confidence to join in too. The school’s PTA needs to raise £14,000. It has a crowdfunding page at www.gofundme.com/blackhorse-primary-running-track.